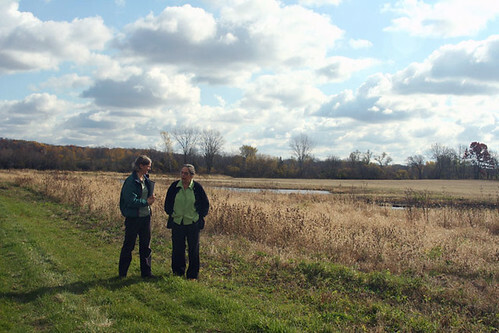 Left to right: NRCS biologist Kristin Westad visiting the wetland restoration area with landowner Elsbeth Fuchs on her Wisconsin farm. Although we know that farm conservation practices, like cover crops, reduced tillage and nutrient management, as well as improve overall performance and environmental outcomes, it’s difficult to say exactly how these practices affect resources, such as water quality. We can say that the water coming off of a field with conservation practices might “look cleaner,” but what does this really mean in terms of nitrogen, phosphorous, and sediment? These challenges can make it difficult for producers to decide which practices to implement, because there’s no way to determine which are the most effective at improving their soil health or reducing their environmental impact. There’s an element of risk as well, because it’s difficult to predict how new conservation practices might affect yield. To address this problem, USDA has worked with the Texas Institute for Applied Environmental Research at Tarleton State University to create a new national version of the Nutrient Tracking Tool (NTT). NTT is a field-specific tool to help assess the water quality improvements of conservation practices on farms. This free, online tool will quantitatively estimate nutrient and sediment losses and estimate yield impacts, helping to inform conservation decisions on the farm. Quantifying environmental outcomes from conservation isn’t just useful for on-farm decision-making—it is necessary for farmers who wish to participate in market-based programs like water quality trading. In these programs, farmers might sell one pound of phosphorous, for example, to a wastewater treatment plant that needs to meet a water quality limit. This way the plant meets their limits at a lower cost, and the farmer receives a payment for improving water quality. “We need transparent, user-friendly tools that communicate how investments in agricultural BMPs are improving water quality in our rivers and streams,” said Carrie Sanneman, from the Willamette Partnership. “A tool like NTT will facilitate the development of markets where farmers get paid for the water quality benefits they provide." NTT was developed through a partnership between USDA’s Office of Environmental Markets and the Texas Institute for Applied Environmental Research at Tarleton State University. Researchers at Agricultural Research Service provided technical support through region-specific parameterization for the model. NTT is based on the Agricultural Policy / Environmental eXtender (APEX) model, the same model used by the NRCS Conservation Effects Assessment Project (CEAP). This release marks the first national version of the tool, which has previously been developed for the Chesapeake Bay and a limited number of pilot states. NTT is free and available to the public at http://ntt.tiaer.tarleton.edu. Those interested in learning more can attend a webinar hosted by the Office of Environmental Markets on February 14 at 2pm EST. Seems that I missed the webinar today due to some tech difficulties with Zoom. Will this presentation be posted to the web for viewing at a later date? Very interesting stuff. I checked out the Tarlteton link at the bottom of the article and the toolset there was great. Thanks!